As my Sony FS5 seems to grow in size every day, I’ve found that it’s getting harder to shoot handheld. And that’s a shame, because that’s what this little camera is born to do. But when you add a Shogun for recording raw, a Teradek Serve Pro for clients, and a battery plate to keep it all running, it’s a lot to bear. Yet there’s still nothing like going handheld when you have to work quickly. And it turns out there’s a tool that supports that style of working. It’s called Hipshot in the LA area. It’s designed to transfer the weight of the camera to your hips, which are better suited to load bearing than your arms and back. 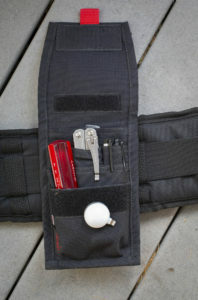 I find that using the Hipshot, I’m able to work for long periods without a break, with minimal effort. It takes a little practice to get used to moving, stopping, positioning the camera, and rolling, all from the hip. You can’t get traveling shots this way – not smooth at all when you start walking. How does it compare to a shoulder rig? Since I’m a tallish guy, I find that a shoulder mounted camera is rarely a good thing. Looking down on the world just isn’t that interesting of a perspective. The Hipshot gets the camera down where I more typically want it: so I can slightly angle upward at the action, making the shots more immersive. 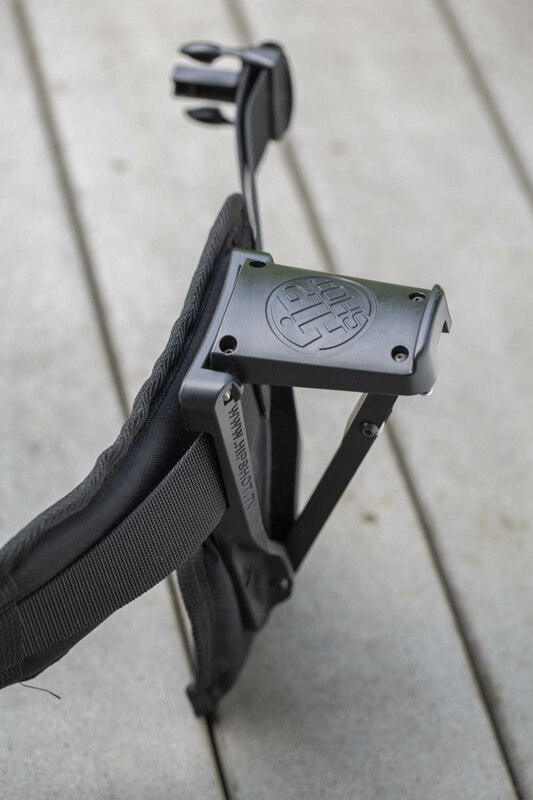 It’s particularly great for shooting things that are happening on a tabletop, or seated activities. The belt is NOT cheap, nor is it cheaply made. It’s a cool $385 bucks, but my back has already thanked me for spending every penny. I look at it as a lifetime investment. If you’re in the Seattle area and want to try before you buy, you’re in luck. 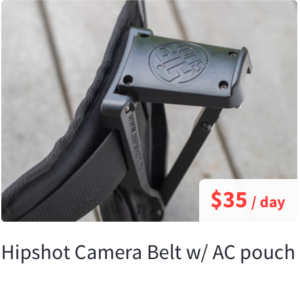 This belt, including AC pouch and all contents, is available for rent on ShareGrid for $35/day. How do you support your camera when shooting b-roll handheld? This entry was posted in Product reviews on May 21, 2018 by Dan McComb. Thanks for posting this. Looks like a slick idea, but price seems a little crazy— couldn’t we make one of these? The price reflects the fact that it’s a niche product for a niche market. It says a lot about this country that you could buy a gun belt for a lot less money.